Objective: To explore the composition of the ocular microbiome in normal subjects and patients with Meibomian gland dysfunction (MGD). Subjects and methods: Seventy subjects (140 eyes) were enrolled in our study. 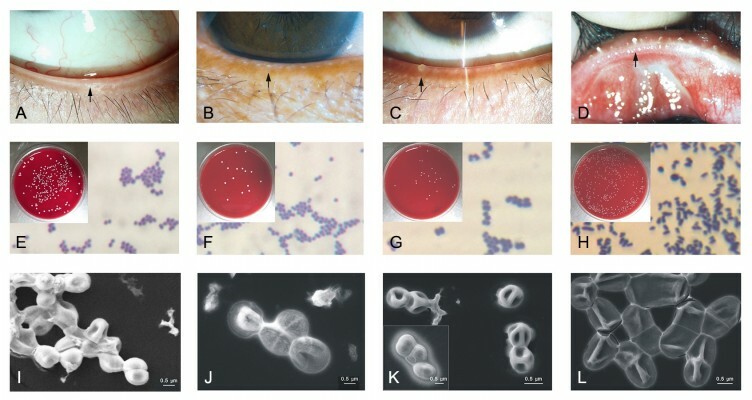 Signs of dry eye were evaluated and bacterial species in the conjunctival sac (CS) and Meibomian gland (MG) secretions were then identified by 16S rRNA gene sequencing. Additionally, 17 subjects (34 eyes) were further evaluated to determine differences in the microbiomes in the surface and deep layers of MG using a segmental secretion analysis. Results: The positive bacterial isolation rate was markedly higher in MG secretions than in the CS. The bacterial composition of the control and mild group was simple, whereas the composition of bacteria was more complex as the severity of MGD increased. The positive bacterial isolation rate and number of bacterial types were significantly higher in the severe MGD group than those in the control, mild and moderate MGD groups. Corynebacterium macginleyi was only detected in the severe MGD group, with an isolation rate of up to 26.3%. Furthermore, a new grading system for bacterial severity of MGD was proposed and the severity of MGD appeared to be positively correlated with a higher grade of bacterial severity. The segmental secretion analysis showed severe MGD had a significantly higher incidence of bacterial discordance rate. Conclusion: The severity of MGD was positively correlated with a higher isolation rate, a greater number of bacterial species, and a higher grade of bacterial severity, which implied that MGD might be correlated with bacterial changes. This study provided some basis for the indications of antibiotic in clinical practice.